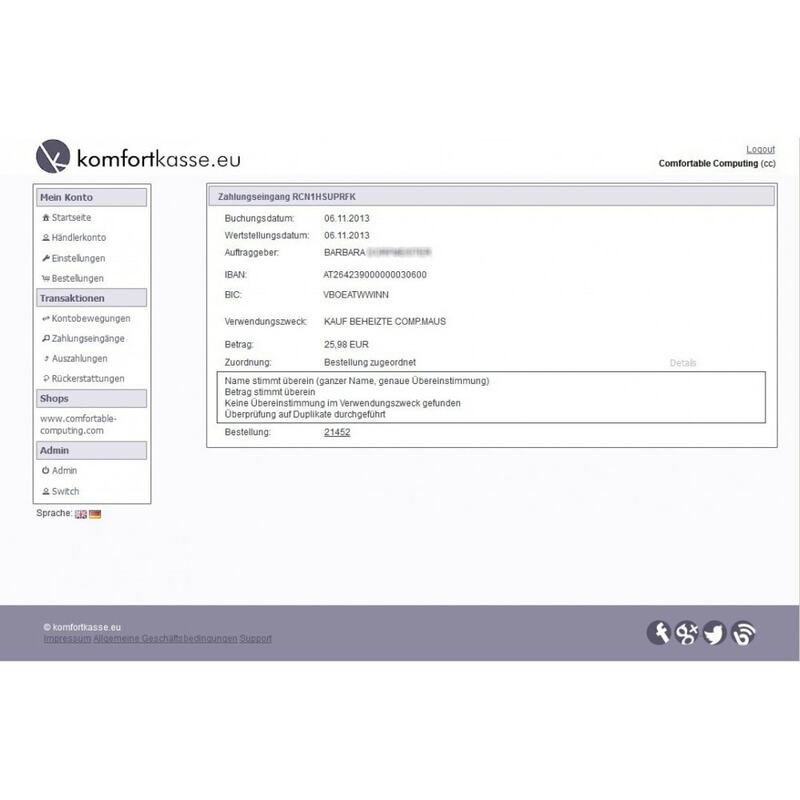 Komfortkasse retrieves bank transfers from a bank account and automatically assignes them to unpaid orders. The assignment is done automatically in the background and is fault-tolerant. * Send your PrestaShop order number to support@komfortkasse.eu to redeem your starting credit. Your customers will receive beautiful payment instructions including QR code for automated payment. In PrestaShop Back Office, go to Modules and Services. Make sure you filter by Installed & Not Installed and Enabled & Disabled. Enter Komfortkasse in the search field. 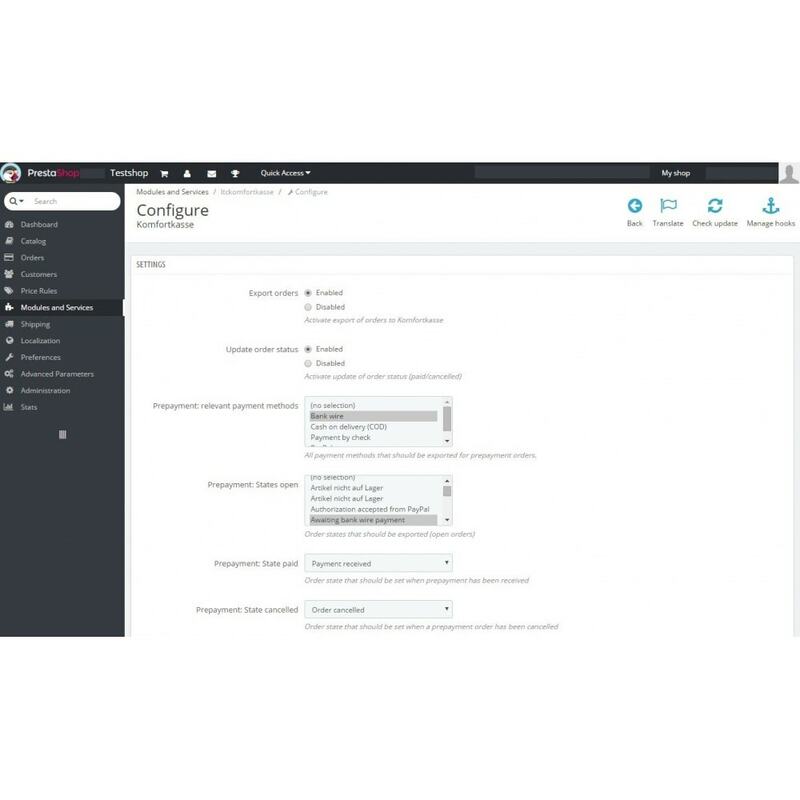 In the Search results, look for the Komfortkasse module and select Install. You will now see a message that the module has been installed successfully and will be redirectes to the Settings page. Make sure that Export orders and Update order status are enabled. Now, choose the settings for the three payment types supported by Komfortkasse: Prepayment, Invoice and COD. Select the payment method(s) that you use for prepayment. Normally, this will be Bank wire. Select the order statuses that a bank wire order is considered "open". Normally, this will be Awaiting bank wire payment. Select the order status you want to be set when payment for an order is received. Normally, this will be Payment received. Select the order status you want to be set when the order gets cancelled because no payment is recieved. Normally, this will be Order cancelled. For invoice (and COD), payment will be recieved after shipping. In a default PrestaShop installation, there are no order statuses that represent an order that has been shipped and afterwards paid. Therefore, we recommed to add two extra statuses: one for shipped and paid orders, and one for orders that have been shipped but have never been paid. Select the payment method(s) that you use for invoice. In a default PrestaShop installation, no such payment method exists, you will have to install a module for that. Select the order statuses that a invoice order is considered "open". Normally, this will be Shipped and/or Dispatched. Select the order status you want to be set when the payment is received. This will be one of the statuses that we created before. Select the order status you want to be set when no payment is received. This will be the other one of the statuses that we created before. These orders might be written off or given to a debt collection agency. For COD (and invoice), payment will be recieved after shipping. In a default PrestaShop installation, there are no order statuses that represent an order that has been shipped and afterwards paid. Therefore, we recommed to add two extra statuses: one for shipped and paid orders, and one for orders that have been shipped but have never been paid. Now. get back to the module settings. Select the payment method(s) that you use for COD. Normally, this will be Cash on delivery. Select the order statuses that a COD order is considered "open". Normally, this will be Shipped and/or Dispatched. Select the order status you want to be set when the payment from the shipping company is received. This will be one of the status that we created before. Select the order status you want to be set when no payment is received from the shipping company. This will be one of the status that we created before. These orders will need manual treatment (maybe the order never got delivered, or the shipping company messed something up with the payment). That's it! Do not change the other settings (encryption and keys). These will be set automatically upon connecting your shop.